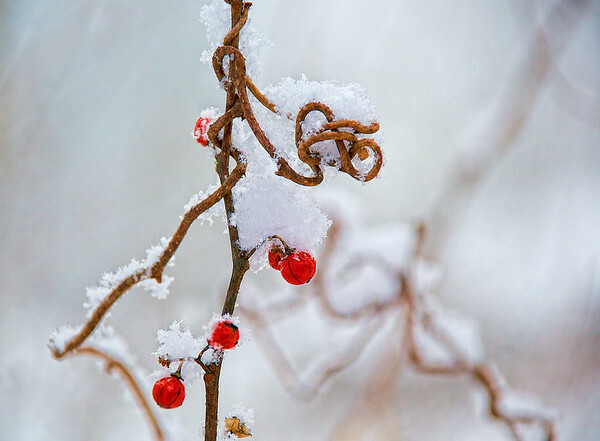 I love the curly vine and red berries against the white snow. Thanks for your comments on my Dead Trees In the Lake image yesterday! Stay warm!! Beautiful shot, great comp, color and detail! I love the red against the snow! Beautiful shot! Terrific winter closeup. The red berries make all the difference. Gorgeous shot! I took some shots of our latest snow, which was like the snow you have here, and was so excited to see I'd gotten individual snowflakes. Wish I'd had some stunning bittersweet with my snow.